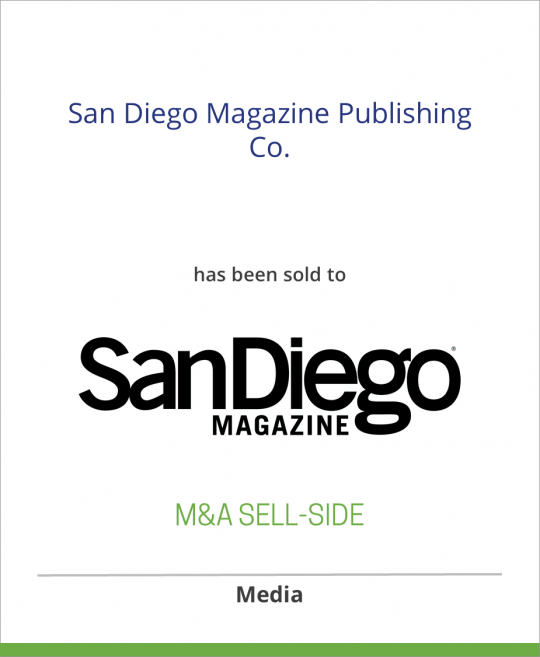 James L. Fitzpatrick, former President & CEO and publisher of San Diego magazine, and Milt and Frank Jones, owners of Palm Springs, CA-based Desert Publications Inc. and regional titles throughout the West, today announced an agreement to acquire the assets of San Diego Magazine Publishing Co., owners of the San Diego Magazine and publishers of a series of custom-publishing titles. Desert Publications Inc. publishes Palm Springs Life, Desert Guide, Pebble Beach: The Magazine, Newport Beach Visitors Guide, Houston Visitors Guide, a variety of custom publications, and annual hardbound, in-room GuestLife publications in Monterey Bay, California; New Mexico, Houston and El Paso, Texas; and Vancouver, British Columbia. Client San Diego Magazine Publishing Co.